Abstract. 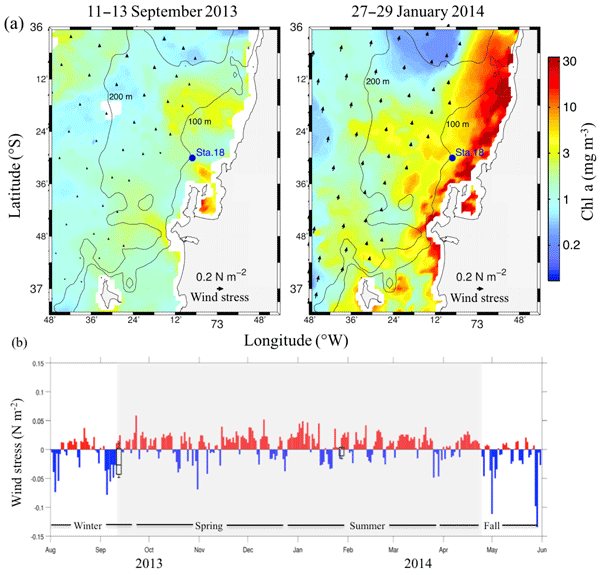 The upwelling system off central Chile (36.5°S) is seasonally subjected to oxygen (O2)-deficient waters, with a strong vertical gradient in O2 (from oxic to anoxic conditions) that spans a few metres (30–50m interval) over the shelf. This condition inhibits and/or stimulates processes involved in nitrogen (N) removal (e.g. anammox, denitrification, and nitrification). During austral spring (September 2013) and summer (January 2014), the main pathways involved in N loss and its speciation, in the form of N2 and/or N2O, were studied using 15N-tracer incubations, inhibitor assays, and the natural abundance of nitrate isotopes along with hydrographic information. Incubations were developed using water retrieved from the oxycline (25m depth) and bottom waters (85m depth) over the continental shelf off Concepción, Chile. Results of 15N-labelled incubations revealed higher N removal activity during the austral summer, with denitrification as the dominant N2-producing pathway, which occurred together with anammox at all times. Interestingly, in both spring and summer maximum potential N removal rates were observed in the oxycline, where a greater availability of oxygen was observed (maximum O2 fluctuation between 270 and 40µmolL−1) relative to the hypoxic bottom waters ( < 20µmolO2L−1). Different pathways were responsible for N2O produced in the oxycline and bottom waters, with ammonium oxidation and dissimilatory nitrite reduction, respectively, as the main source processes. Ammonium produced by dissimilatory nitrite reduction to ammonium (DNiRA) could sustain both anammox and nitrification rates, including the ammonium utilized for N2O production. 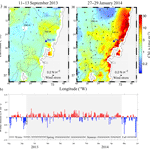 The temporal and vertical variability of δ15N-NO3− confirms that multiple N-cycling processes are modulating the isotopic nitrate composition over the shelf off central Chile during spring and summer. N removal processes in this coastal system appear to be related to the availability and distribution of oxygen and particles, which are a source of organic matter and the fuel for the production of other electron donors (i.e. ammonium) and acceptors (i.e. nitrate and nitrite) after its remineralization. These results highlight the links between several pathways involved in N loss. They also establish that different mechanisms supported by alternative N substrates are responsible for substantial accumulation of N2O, which are frequently observed as hotspots in the oxycline and bottom waters. Considering the extreme variation in oxygen observed in several coastal upwelling systems, these findings could help to understand the ecological and biogeochemical implications due to global warming where intensification and/or expansion of the oceanic OMZs is projected. How to cite: Galán, A., Thamdrup, B., Saldías, G. S., and Farías, L.: Vertical segregation among pathways mediating nitrogen loss (N2 and N2O production) across the oxygen gradient in a coastal upwelling ecosystem, Biogeosciences, 14, 4795-4813, https://doi.org/10.5194/bg-14-4795-2017, 2017.